The Striped Marlin “Bill Gray” was caught by angler Dave Bulthuis of Costa Sun Glasses on Nov. 1st, 2016, and tagged with a satellite tag (PSAT). The PSAT stayed on the fish and collected data for 68 days. Fish length at capture: 81” LJFK]At its closest point, the fish was 2.66 km (1.65 mi) from the beaches of Los Cabo. 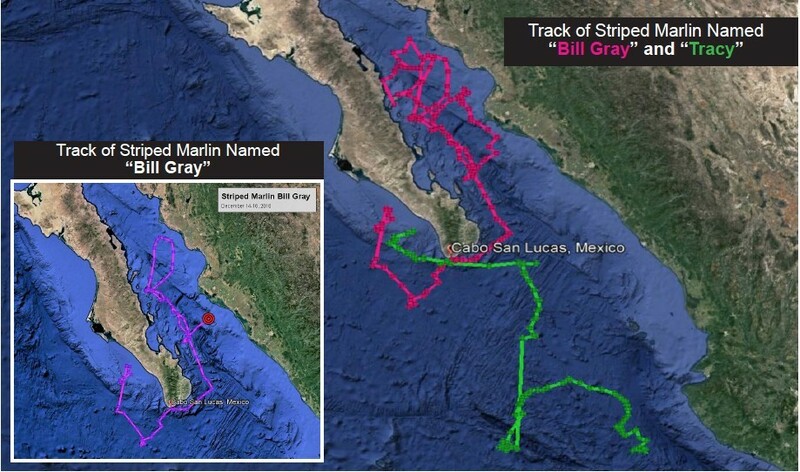 The Striped Marlin traveled a total of approximately 2,485 km (1,544 mi) in a track around the tip of Baja and North into the Sea of Cortez. 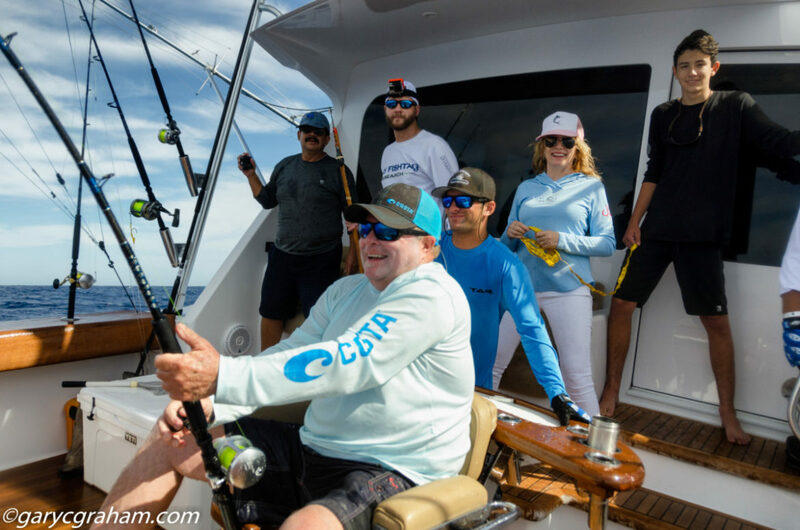 While in the Sea of Cortez, it made large circle patterns exhibiting a feeding behavior until it was finally caught and harvested near Isla Carmen. The Striped Marlin exhibited a very large vertical movement pattern which varied depending on daylight or darkness. It had an average nighttime depth of surface to 10 m with an occasional dive to deeper depths. 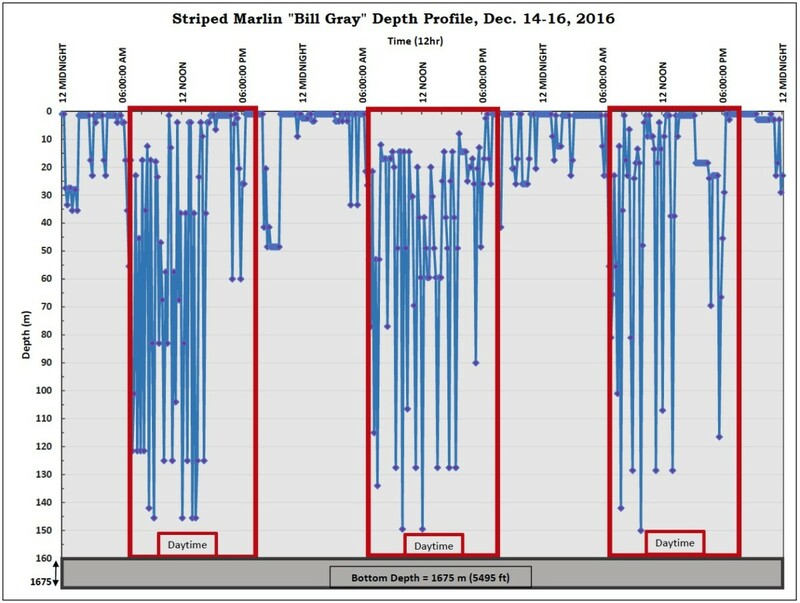 The fish illustrated extensive vertical movements during the daytime, with rapid dives to 125 m followed by ascents to 15 m. Overall the Striped Marlin had a daytime average depth of 50 m.
Both Striped Marlin “Bill Gray” and “Tracy” were tagged on the same day; however, one fish went north to the Sea of Cortez and the other fish went south. They both also demonstrated a vertical movement pattern similar in profile to swordfish, with nighttime hours spent at the surface and daytime hours spent at depths 40-80 m.